I'll admit it, I am ridiculously behind in my yearly theatre retrospective. It's not that I haven't been shooting (I have), or I'm not interested in my theatre project anymore (I am), it's just that things get shuffled around sometimes and unfortunately the theatres of 2012 have been relegated to the back burner. I'm committed to complete last years' entries before the end of this year, so let's get started with the first four theatres now. 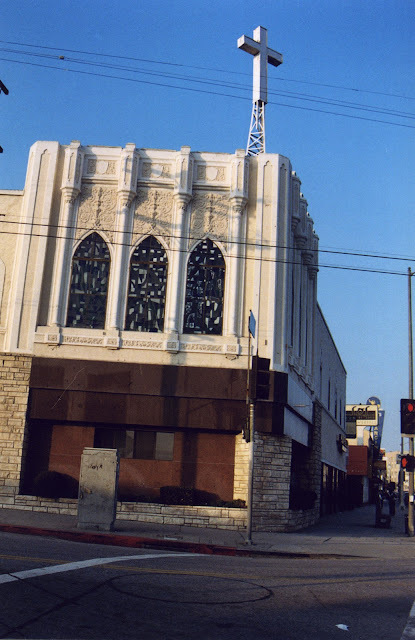 The Fox La Brea Theatre sits precariously at the corner of La Brea and West 8th Street in Los Angeles. The La Brea opened in 1926 and closed in the 1950s. Despite a brief run in the 1960s as an art house, and then in the early 1970s as a Japanese theatre, the La Brea ceased operation as a theatre in 1974. It is currently in use as a Korean church. The Bay Theatre in National City, CA opened in 1944. It was designed by renowned cinema architect S. Charles Lee, who designed such theatres as Inglewood's Fox and Academy (both of which are still standing) and my favorite movie house ever, San Diego's Ken Cinema. 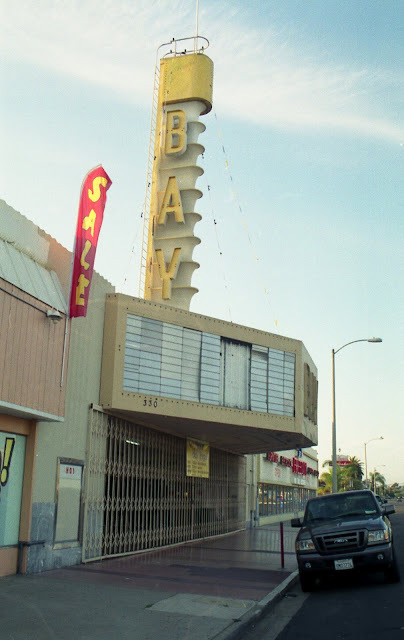 Just like the La Brea, the Bay ended its run as a theatre and housed a church for many years. Unfortunately, the Bay now sits vacant, awaiting its next incarnation. Los Angeles' El Rey Theater opened as a cinema in 1936. After many successful years on Wilshire Blvd., the theater was converted in 1994 to a live performance venue and continues to be one of the best small venues in the city. 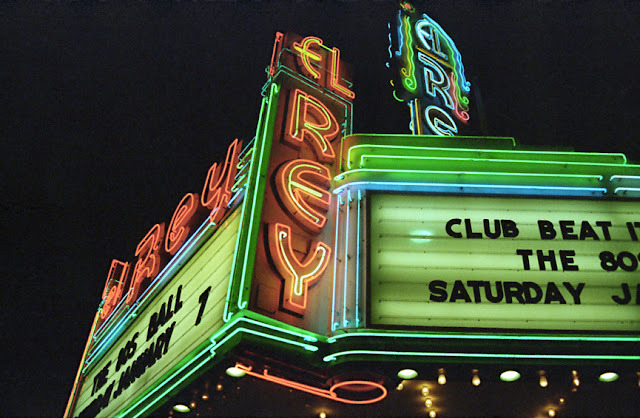 In 1991, the El Rey was given status as a Los Angeles Historic-Cultural Monument for the Wilshire District, joining another gem of a theatre, the Wiltern. I couldn't get through a theatre post without profiling one killed by the 1980s, could I? The Del Mar opened on Pico Boulevard in Los Angeles in April of 1936. 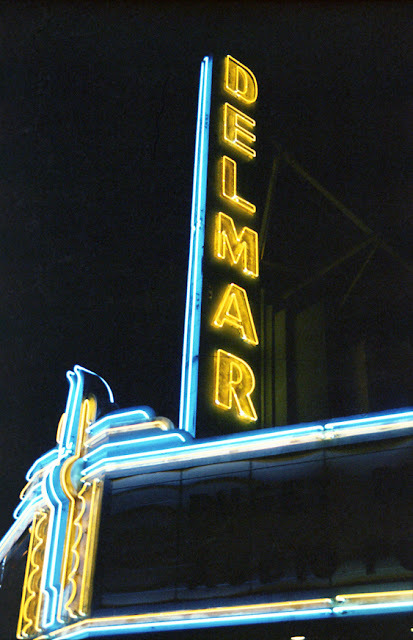 Out of business in the eighties thanks to multiplexes/home movies/etc., the Del Mar had a short run as a church before the auditorium was gutted and leveled for retail. The silver lining to the Del Mar's cloud is that Puget Sound, Inc., a group that does post-production audio work for movies, took over the theatre in the early 2000s and restored the facade with help from the Pico Revitalization Project. The Del Mar's beautiful neon shines nightly, a wonderful tribute to its days of being a neighborhood movie house. There's more to come, and soon. In the meantime, check out the theatres of 2011 retrospective.